Dr. Klinghardt was on a spiritual trip to India in the 1980s and discovered from a yogi the 5 levels of healing in Ayurveda and Yoga. Over the years, it germinated and bloomed into the understanding of healing that he teaches today. This is a system which is generally familiar to most naturopathy and complementary and alternative practitioners. 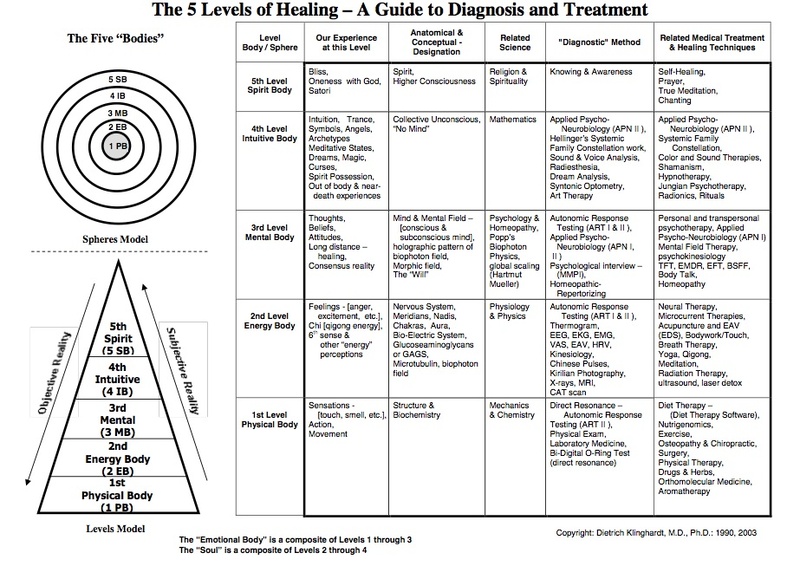 This is also an approach that I have been taking The other test we use is to see if the issue needs to be addressed from the physical/structural level, personal ecology level, emotional level or energetic level. Aren’t there some of you to whom I say “Sadhana” or the M-word, Meditation… O:-> ? For the full article and video introduction, visit the Klinghardt Academy. For more on the Ayurveda System check out the DeepDive? BookStore’s Ayurveda recommendations.